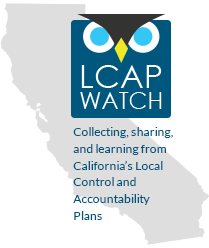 LCAP Watch is committed to creating public transparency into school district plans and budgets. When Governor Jerry Brown dramatically reformed school funding in 2013, he also required that school districts engage in an open, transparent, and public budgeting and planning process. A central component of this is the Local Control and Accountability Plan, or LCAP. The LCAP is the district’s 3-year plan for how it will use state funding to serve all students, including low-income students, English learners, and foster youth. In the LCAP, the district presents its goals, actions, and expenditures. The district must describe what needs each goal addresses and the metrics being used to measure progress. After 2014-15, districts will report how the actions presented in the LCAP have improved outcomes for students. The actions must address how each major student group will be served and must cover 8 priority areas: basic services, implementation of standards, parental engagement, student achievement, student engagement, school climate, access to courses, and other student outcomes. County offices of education have to address two additional priorities related to instructional for expelled students and services for foster youth. LCAP Watch is a repository for these plans and resources developed to help support districts in developing strong LCAPs. We encourage users to view and share LCAPs, closely study these plans, and engage with local school districts to monitor and improve the plans over time. We believe that public engagement in the planning process will make our schools better for all students. LCAP Watch is managed by the Education Trust–West and represents a coalition of partner organizations who have helped make the content possible. Updates on school funding, LCAPs, and other issues affecting students. We are crowdsourcing the collection of LCAPs. We need your help. If you have a draft or final LCAP to share, add it to our database.